Café Brazil opened for business in December 1991, nestled in the Lakewood area of Dallas, Texas. Café Brazil was founded as a quaint, ten-table restaurant, where you could enjoy a great breakfast and specialty roasted coffees from around the world in a smoke-free, eclectic, relaxing and fun environment. The concept in its original form was an instant success with crowds lined up outside the door 24 hours a day. Soon, Café Brazil expanded to University Park, where the concept entrenched itself as a very popular weekend destination and the premier “deep night” dining spot. Locations were added throughout the Metroplex in Deep Ellum, Cedar Springs, Richardson and Carrollton. In April 2004, the company was purchased by a group of local restaurant executives with the idea of enhancing the brand, rejuvenating existing locations and growing Café Brazil beyond its successful roots. In May 2006, Café Brazil moved from its aging Lakewood spot to a newly renovated Lower Greenville Avenue location. In October 2006, the company added its 8th location in Plano at the northeast corner of Coit & 190. In June 2007, Cafe Brazil Addison opened at the southwest corner of Beltline & Quorum. Our newest locations are located in the Bishop Arts District at Bishop & Davis, on the TCU Campus in Fort Worth and in Denton. Café Brazil has received widespread critical acclaim over the last few years including multiple awards from the Dallas Observer, D Magazine and others including Best Breakfast, Best Late Night Dining, Best Coffee, Best BLT and Best Grilled Cheese. The future calls for continued expansion in the Dallas/Fort Worth Metroplex. 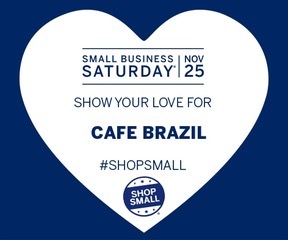 Keep your eyes open for a Café Brazil in your neighborhood.